At least three people were shot dead as violence erupted during anti-government protests in the Venezuelan capital, Caracas, on Wednesday. The violence broke out after some 10,000 demonstrators had gone home following a mainly peaceful rally. Two people died after gunmen on motorbikes opened fire on the remaining crowd. A third died in later clashes. The march was the latest in a series of mass protests against the policies of President Nicolas Maduro. A crowd of demonstrators, many of them students, marched to the federal prosecutor's office to demand the release of 13 protesters who they say were illegally detained in previous marches. A small group of protesters stayed behind after the end of the main march and clashed with the security forces. It was at that time that a number of armed men on motorcycles shot at the crowd, triggering a stampede. Anti-government protester Bassil da Costa, 24, was hit by a bullet and killed. Also shot in the ensuing chaos was government activist Juan Montoya, who is believed to have been taking part in a rival, pro-government rally. It is not clear whether the two victims were hit by the men on motorcycles or by other assailants. The president of Venezuela's National Assembly, Diosdado Cabello, blamed the killing of Mr Montoya on "fascists", without further clarifying who they might be. 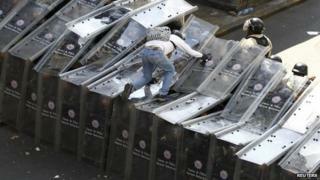 A third man was shot dead during anti-government protests in the east of the capital. President Nicolas Maduro condemned the incidents, which he blamed on a "neo-fascist upsurge". The president called for peace, but stressed that those who engaged in violence would not go unpunished. "There will be no coup d'etat in Venezuela, you can be absolutely sure of that, let the whole world know that," he said in a TV and radio broadcast. Opposition politicians meanwhile called for new protests. "Just as we condemn the violent incidents, we say to all Venezuelan families that we have to remain ready to continue fighting, calmly but with determination," Caracas mayor Antonio Ledezma said. "You have to know, Mr Maduro, that whatever you do, what started today will not stop until change is achieved in peace and with democracy for all Venezuelans," he added. The march on Wednesday was the latest in a series of anti-government demonstrations in which protesters have demanded the resignation of President Maduro. Students in the western states of Tachira and Merida have been at the forefront of the protests, saying they are fed up with the lack of security and the poor state of Venezuela's economy. Venezuela has one of the highest murder rates in the world and is deeply politically polarised, with the opposition blaming the government for the country's economic troubles. The country has the highest inflation rate in the region at 56.2% in 2013, according to official figures. It is also beset by shortages, with shoppers often having to search a number of supermarkets for staples such as milk and toilet paper. The government has blamed the shortages on "saboteurs" and "profit-hungry corrupt businessmen". Venezuela's economic woes: Sabotage or mismanagement?